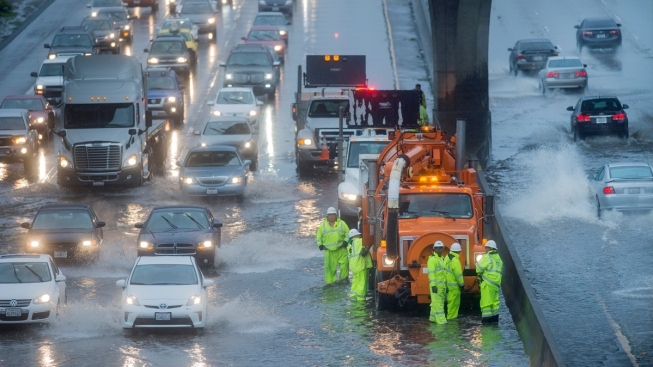 A Caltrans crew tries to clear a flooded stretch of Highway 101 in South San Francisco, Calif., on Thursday, Dec. 11, 2014. A powerful storm churned through Northern California Thursday, knocking out power to tens of thousands and delaying commuters while soaking the region with much-needed rain. Ten trillion gallons of rainwater soaked the Golden State during the week of the Bay Area's largest storm in five years, according to one estimate. That amount is enough to power Niagara Falls for 154 days. One meteorologist made the calculation by figuring out the average amount of rain that fell over one square mile. Then, he multiplied that by the amount of square miles in the state. More storms are expected to hit the Bay Area late this weekend. 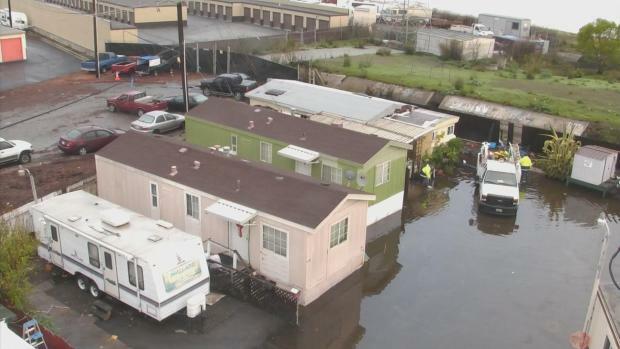 Thursday's storm left two Redwood City mobile home parks underwater. On Saturday, residents were still dealing with the soggy aftermath. NBC Bay Area's Christie reports with a first-hand look at the damage of these homes.